NORTHERN Ireland will be the region of the UK to suffer the greatest financial loss under planned welfare reform, according to a new report launched in Belfast today. It states that when the reforms come into full effect they will take £750m annually out of the economy here – equivalent to £650 for every adult of working age, research by academics from Sheffield Hallam University (SHU) found. 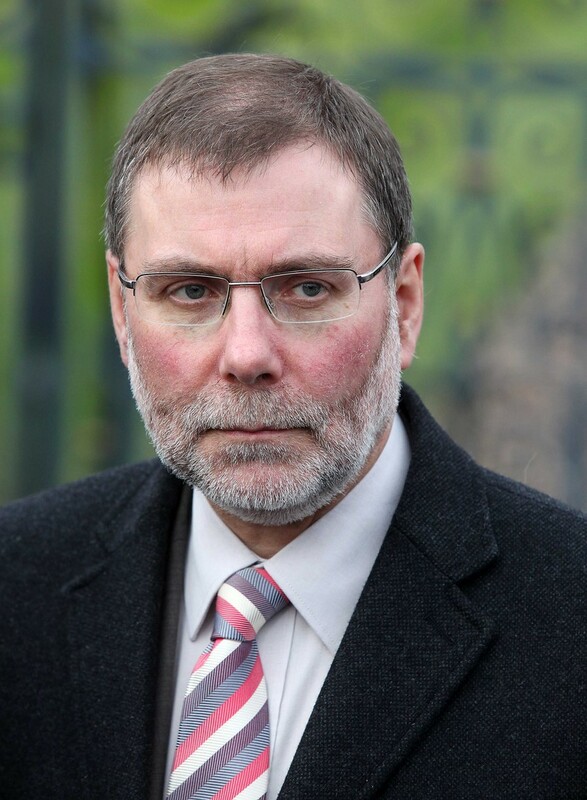 Social Development Minister Nelson McCausland responded swiftly to the report saying a large element of the £750m related to controls in future uplifts of individual benefits and he likened it to “what many working families have had to deal with during the recession”. The research commissioned by the Northern Ireland Council for Voluntary Action (NICVA) has identified Belfast, Derry and Strabane as the council areas which will be hardest hit by reform. Derry tops the table with an estimated loss of £900 a year for every adult of working age. Generally, across Northern Ireland, the areas identified as being already the most disadvantaged face the most severe change to the welfare regime. As our interactive map above shows, the north and west of Northern Ireland and Belfast are said to be the areas which should brace themselves for the biggest financial impact. The research reported that in one of Northern Ireland’s least deprived council areas – North Down – the estimated loss per working age adult is only £450 a year which equates to only half of the loss predicted for people living in Derry. ‘Impact of welfare reform on Northern Ireland’ by Christina Beatty and Steve Fothergill, both professors in the Centre for Regional Economic and Social Research at SHU, was commissioned by NICVA – a representative umbrella body for the voluntary and community sector here. NICVA chief executive Seamus McAleavey said: "The facts in this report make for stark reading for everyone in Northern Ireland – whether they receive benefits or not. “Not only will Northern Ireland fare much worse than anywhere else as a result of welfare reform but we will also be even pushed further down the ladder when it comes to levels of prosperity across the UK. “At a time when many commentators are beginning to report that the economy is turning a corner, the impact of the removal of £750m spending power has the potential to undo any positive developments. Also today, The Detail’s Steven McCafffery looks at the options facing the two main parties in the Northern Ireland Assembly after months of them privately discussing how to handle welfare cuts being imposed by Westminster. Click here to read Steven’s analysis. The Northern Ireland report follows on from two similar studies undertaken by the same researchers and released in April 2013 which examined the impact of the welfare reforms in England, Scotland and Wales. Read the Financial Times’ coverage of this here. The new report provides figures for each of our 26 local council districts and also compares Northern Ireland to the rest of the UK. All of the figures in the report are estimates but in every case are deeply rooted in official statistics – for example in the Treasury’s own estimates of the financial savings, the Westminster government’s Impact Assessments and benefit claimant data. 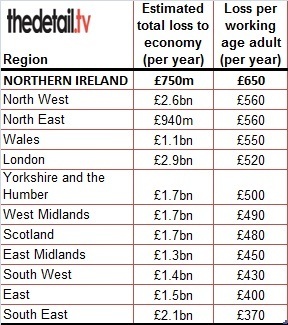 The projected financial loss to Northern Ireland, per adult of working age, is substantially larger than in any other part of the UK. The academics note that the exceptionally large impact of the reforms here owes much to the UK’s highest claimant rates of incapacity benefits and Disability Living Allowance, two of the main targets for reform. The authors state that the figures presented in the report cover the major welfare reforms currently under way or which form part of the Welfare Reform Bill currently before the Northern Ireland Assembly. In a comment article written for The Detail, they say that some households and individuals will be hit by several different elements of the reforms and, as a result, could be exposed to losses of up to £6,000-7,000 a year. To read their comment article in full, click here. And here to see further details on the planned welfare reform. The report says the figures it is presenting show the impact when the reforms have come into full effect. Some of the reforms, particularly those affecting incapacity and disability benefits, are being implemented in stages over a number of years. When fully implemented, which may not be until 2018, the reforms covered in this report are expected to save the UK Treasury almost £19bn a year. In examining the impact on Northern Ireland, the report looks in particular at the financial loss per adult of working age (16-64) as the welfare reforms impact almost exclusively on this group. This covers all of the working age population in an area and includes claimants and non-claimants. It also holds all other factors constant so makes no assumptions about the growth of the economy or employment levels. Overall, when the reforms have come into full effect it is estimated that they will take £750m a year out of the Northern Ireland economy, or around £650 a year for every adult of working age, the report finds. The individual welfare reforms vary greatly in the scale of their impact, in the number of individuals or households affected, and in the intensity of the financial loss imposed on those affected. A great deal of media coverage has focused on the ‘bedroom tax’ – however in Northern Ireland the biggest financial impact comes from the reform of incapacity benefits which the researchers estimate will result in a total loss of £230m a year. This will have an adverse impact on 66,000 individuals who are expected to lose on average £3,480 per year. In contrast, the ‘bedroom tax’ is expected to impact on 33,000 households with an average loss of £620 per home. Changes to Tax Credits and the 1 per cent up-rating of most working-age benefits also account for substantial total sums with annual losses for Northern Ireland of £135m and £120m respectively. The reforms to Disability Living Allowance remove a further £105m a year. Child benefit changes affect the largest number of households – more than 240,000 in Northern Ireland. Each household will lose around £330 per year. The household benefit cap, by contrast, impacts on relatively few households in Northern Ireland – an estimated 620 – but the average financial loss for each of these households is relatively large (£4,810). Sickness and disability claimants can expect to be hit hard. The 66,000 individuals adversely affected by the incapacity benefit reforms can expect to lose an average of almost £3,500 a year and the 67,000 people losing out as a result of the change over from Disability Living Allowance to Personal Independence Payments by an average of more than £2,100 a year. Often these will be the same individuals: most DLA claimants of working age are out of work on incapacity benefits and in both cases the group most exposed to benefit reductions are those with less severe disabilities or health problems. The researchers say that the large loss of income to Northern Ireland will have knock-on consequences for local spending and thus for local employment, which will add a further twist to a downward spiral. Northern Ireland Independent Retail Trade Association chief executive Glyn Roberts said: "The loss of £750m to our local economy means that already struggling local retailers will lose a very considerable amount of spending. “We already have one in four shops vacant, which is twice the UK national average, and I fear that losing £750m from the economy will only increase the number of shops closing." The three local government districts hit hardest by the welfare reforms are Derry, Strabane and Belfast, the researchers have found. In these three areas the financial loss, averaged across the whole working age population between the ages of 16 and 64, is over £800 a year, with Derry reaching the £900 mark. Belfast is Northern Ireland’s largest city by some margin so here the overall loss of benefit income – nearly £150m a year – is very substantial. In a further 12 districts the financial loss per working age adult is £600 a year or more. By contrast, in North Down the estimated loss per working age adult is only £450 a year – half the level in Derry. It is to be expected that welfare reforms will hit hardest in the places where welfare claimants are concentrated, which in turn tend to be the poorest areas with the highest rates of worklessness and the lowest incomes. The SHU researchers found a clear and unambiguous relationship in the Northern Ireland data. As a general rule, the more deprived the local government district, the greater the financial hit. The deprivation measure used by the academics is the percentage of each council area’s population living in the 30% most deprived super output areas (SOAs) in Northern Ireland. This ranges from 83% in Strabane to 6% in Ballymoney. SOAs are designed to be as similar as possible in population size. In Northern Ireland there are 890, each with around 2,000 people. See the Excel spreadsheet below this article for a detailed breakdown of the impact in each council area by each benefit type. The researchers estimated that the welfare reforms will cost each working age adult in Strabane £870 a year when they are fully implemented. This is the third highest annual loss of all UK districts – just behind Blackpool (£910) and Derry (£900). Strabane was ranked by the academics as the most deprived area in Northern Ireland with 83% of its super output areas among the 30% most deprived in Northern Ireland. The Detail visited Strabane last week to seek local opinion on the impact of welfare reform on the area. The thousands of people who seek help and advice every year from Strabane Citizens Advice Bureau come from a wide range of backgrounds and include young and older people, people in work, those out of work, people with disabilities, lone parents, two-parent families and carers. Regardless of their differing circumstances, bureau manager Janine Sayers said they are all struggling financially. “Financial problems can cause stress an anxiety in families and can even lead to relationship breakdowns or relationships with dependence on alcohol or drugs and this can make it very difficult to get back into work again,” she said. “Strabane is already known as a high unemployment and black spot area and it is disheartening for our clients to know that is not going to change." Within walking distance of the bureau’s office in the centre of Strabane is the first food bank to open in the north west of Northern Ireland. Based on the main street of the town, the shelves inside the shop are stocked with food and drink products like pasta, cereals, tins, tea, coffee and dried milk. The food bank was set up by Strabane Community Project – supported by food bank specialists the Trussell Trust – in response to the high child poverty levels in the area. Staff member Ursula Gallagher, who fund raises for the food bank, explained that families can receive three days worth of food in a crisis situation three times in six months. After this they would be referred on to other organisations for additional support. In the first six weeks, emergency food supplies were provided to 108 local people including 42 children. It is predicted that demand will greatly increase. “We have helped working people as well as those on benefits or low incomes,” Ursula said. WHY IS NORTHERN IRELAND HIT SO HARD? In terms of the impact per adult of working age, the welfare reforms hit Northern Ireland substantially harder than any other part of the UK, according to the research. The average financial loss per head in Northern Ireland (£650 a year) is well ahead of the comparable figures for Scotland (£480) or Wales (£550) and also well ahead of the two hardest-hit English regions, the North West and North East (both at £560). The consequence is that Northern Ireland, with 3% of the UK population, faces 4% of the overall financial loss arising from welfare reform (£750m a year out of a UK total of just under £19bn a year). Professors Beatty and Fothergill list the 50 worst-hit local authority areas across the UK. Northern Ireland districts occupy three of the top four spots (Derry, Strabane and Belfast), seven out of the top 20 and eleven out of the top 50. Considering there are only 26 local government districts in Northern Ireland out of more than 400 in the UK, the academics describe this as “a disturbingly high representation”. Only two local government districts in Northern Ireland (Castlereagh at £460 a head and North Down at £450 a head) have an estimated impact that is less than the average for Great Britain. Above all it is the combination of the incapacity and disability benefit reforms that push Northern Ireland so far ahead of the GB average. Together, the incapacity benefit and Disability Living Allowance reforms are responsible for three-quarters of the gap between the overall impact of the welfare reforms in Northern Ireland and GB. The overall incapacity claimant rate in Northern Ireland in November 2012 was 10.1% – one-in-ten of all adults between the ages of 16 and 64. This puts Northern Ireland well ahead of the GB average of 6.5% and ahead of all other UK regions. Derry (13.8%), Strabane (13.4%) and Belfast (13.4%) have the highest incapacity benefit claimant rates anywhere in the UK, higher even than the Welsh Valleys, which have long been known to include some of the highest concentrations of incapacity claimants. Northern Ireland also has the highest DLA claimant rate among adults of working age – 10.1% in May 2012. This compares to 6.2% in Scotland, 6.8% in Wales and an average of 4.9% across Great Britain as a whole. The researchers say that one of the reasons why Northern Ireland has incapacity and disability claimant rates that are so much higher than other parts of the UK with relatively weak labour markets may be the long-term impact of the Troubles. There is for example evidence that the Troubles have resulted in significant mental health problems. However, the academics say that whether this factor can account for the whole of the difference is unclear. In response to the report, Social Development Minister Nelson McCausland said: “I welcome any report which contributes to our understanding of the impact of Welfare Reform on Northern Ireland. “It is important however that we do not cause concern amongst benefit claimants by reports suggesting that their benefits are going to be cut. “Social security spending in Northern Ireland is projected to increase from £5.5 billion in 2012 to £6.3 billion by 2018 and it is inaccurate to say that social security spending in Northern Ireland is going to be reduced by £750 million. He continued: “It is important that people understand that this report is not about the Welfare Reform Bill and the changes that are currently being considered by the Northern Ireland Assembly. Minister McCausland said he was very much aware of the issues and concerns of people about the changes to the benefit and tax credit systems. And he concluded: "I have now developed a package of measures which I believe should enable us to move forward with the Welfare Reform Bill which need to be signed off by the Executive.